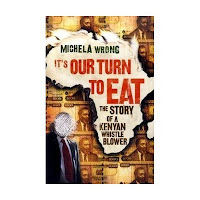 My friend/roomate Elona wrote to me today about Michela Wrong's book "It's our Turn to Eat"; how the lives of educated Kenyans returning home resonates with our stories of being away since age 16 (Elona and I both left our home countries and families to go to Wales, UK when we were 16; El has just recently returned to Albania and I'm still away from South Africa). My experience has been that leaving home to study took on a life of it's own, totally apart from my Big Plans (big plans overestimating ones control), because it's very hard to factor in relationships and the life you live while studying. Ok, back to the subject: Wrong writes of Africans returning home profoundly changed by their experiences overseas. I'm not sure if or when we'll head back to South Africa, but there's always been something transient about living in Boston, even as I fully embrace Eug and little blob as my "new" immediate family. There's a constant tension. Although surely numbers are just numbers, I get nervous as the ratio of years spent in South Africa (17) and years overseas (10) start to edge towards eachother. It takes a lot of work to remember to be present and enjoy Boston, and not just feel like all this is preparation for what's to come. That said, I started to realize a few years ago that my Big Contribution to South Africa may not be what I envision. I suspect that if, God willing, we make our big move, we'll find ourselves in a different kind of exile. For one, we'll have a South African-Korean-American son, and be far away from a different side of our family. Accepting this has been hugely helpful for me. Getting a house in SA that isn't totally suburban has also been helpful. All this makes me think of the Somali Diaspora. If, as so many hope, peace comes to Somalia in the next years, what will it mean for the millions of Somalis who have been living outside the country for almost twenty years? What does it mean for children born abroad? What will it mean for Somalis to have every kind of hyphenated identity-- Dutch-Somali, Somali-American, Somali-English, Somali-Swede?